Agaricus bitorquis is an edible white mushroom of the genus Agaricus, similar to the common button mushroom that is sold commercially. The name supersedes Agaricus rodmani. It is also commonly known as torq, the banded agaric, spring agaric, or pavement mushroom, as it has been recorded pushing up paving slabs. The specific epithet bitorquis is Latin "having two collars", and refers to the two rings resulting from detachment of the annulus from both the top and bottom of the stipe. The cap is dry, smooth, and white (but staining yellowish in age), and measures 4 to 15 cm in diameter, convex to flat; often with dirt on the cap. The gills are free, very narrow, close, light pink color when young, becoming dark reddish-brown as the spores mature. The spore print is chocolate brown. The stipe is 3 – 11 cm long, 2 – 4 cm thick, cylindrical to clavate (club-shaped), equal to enlarged at the base, stout, white, smooth, with a membranous veil and thick white mycelial sheathing near the base. The flesh is solid and firm, with a mild odor. It is often confused with Agaricus bernardii; however, that mushroom has a salty odor. 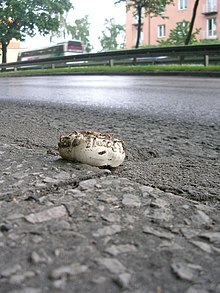 Agaricus bitorquis mushroom emerging through asphalt concrete in summer. Basidiospores are elliptical in shape, smooth, and with dimensions of 5–7 x 4–5.5 µm. Basidia are 20–25 x 6.5–8.5 µm, usually four-spored, but often with two-spored basidia present. Cystidia are present and numerous. Agaricus bitorquis may be found growing solitary or in small groups in gardens (noted as growing in a gregarious manner), and at roadsides, usually on the pavement, often where salt is applied to combat ice in winter. Pushing through asphalt and slabs, it is subterranean, and often matures underground. It is occasional throughout North America, Europe, and Australia. Agaricus bitorquis is a choice edible species, with a typical 'mushroomy' taste. Specimens collected in the wild may be gritty due to its often subterranean habitat. As with all specimens picked from the wild, care should be taken to consider the suitability of the collection site, as this species can bioaccumulate toxic heavy metals, especially lead, from polluted areas. Nutritional analysis has shown this species to contain 18 amino acids, including all of the essential ones. First cultivated commercially in 1968, A. bitorquis has several growth characteristics that have piqued the interest of mushroom cultivators looking for an alternative to the standard button mushroom, A. bisporus. For example, A. bitorquis is more resistant to various viral diseases, can grow at higher temperatures and CO2 concentrations, and has better resistance to bruising. Furthermore, high temperature-resistant strains have recently been developed which may help cultivators overcome problems associated with cooling production rooms during hot summer months. ^ David Arora (1986). Mushrooms Demystified. Ten Speed Press. p. 321. ISBN 978-0-89815-169-5. ^ Cocchia, L., Vescovia, L., Petrinid, L.E, Petrini, O. (2006). Heavy metals in edible mushrooms in Italy. Food Chem. 98(2):277-84. ^ Zakhary, J.W., Abo-Bakr, T., El-Mahdy, A.R., El-Tabey, S.A.M. (1983). Chemical composition of wild mushrooms collected from Alexandria Egypt. Food Chem. 11(1):31-42. ^ Fritsche, G. (1975). Welche Möglichkeiten eröffnet der viersporige Champignon "Agaricus bitorquis (Quél.) Sacc."" dem Züchter? [What potentialities does 4-spored mushroom Agaricus bitorquis (Quel) Sacc. offer to breeders?] Theoretical and Applied Genetics 47(3):125–31. ^ Dieleman-van Zaayen A. (1972). Spread, prevention and control of mushroom virus disease. Mushroom Sci. 8:131-54. ^ Vedder, P.J.C. (1975). Practical experiences with Agaricus bitorquis. The Mushroom J. 32:262-9. ^ Van-Zaayen, A. (1976). Immunity of strains, of Agaricus bitorquis to mushroom virus disease. The Mushroom J. 47:360–3. ^ Hasselbach O.E., Mutsers, P. (1971). Agaricus bitorquis (Quel.) Sacc. ein wärmeliebendes familienmitglied der Champignons. Champignon. 130:20–6. ^ Steane, G.R. (1980). The case for growing Agaricus bitorquis. The Mushroom J. 96:435-8. ^ Vedder, P.J.C. (1978). "Cultivation". In the Biology and Cultivation of Edible Mushrooms, pp. 377–92. Eds: Chang, S.T, Hayes, W.A. Academic Press: New York, San Francisco. ^ Guler, P., Ergene, A., Tan, S. Production of high temperature-resistant strains of Agaricus bitorquis. Afr. J. Biotechnol. 5(8):615-9. ^ Sharma, S.S., Doshi, A. (2001). High temperature tolerant button mushroom (Agaricus bitorquis) and its strains suitable under Rajasthan conditions. J Mycol Plant Pathol. 31(2):256–7.